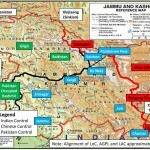 The Chinese intrusion into the area of Daulat Beg Oldi (DBO) on 15th April 2013, reportedly about 15 to 18 KMs South of the Line of Actual Control (LAC), once again brought into public debate the issue of Indian response and military preparedness in Ladakh Region; particularly in Depsang Valley. While Chinese patrols often cross into Indian territory South of LAC, what is significant and unusual about the present incident is the depth of intrusion and the fact that Chinese troops of about a platoon strength are still camping inside with no signs of pulling back. In response to Indian protests, the Chinese Government maintained that it had not provoked the border row. Hua Chunying, the spokesperson of Chinese Foreign Ministry, told reporters at a regular briefing that, “With the boundary not demarcated yet, it is inevitable for problems to creep up in border areas”. The DBO incident perhaps is an expression of Chinese displeasure and flexing of muscle in the wake of recent Indian efforts at building infrastructure in Ladakh Sector which has long been delayed. Various motives for the present intrusion were assigned ranging from Chinese new assertiveness in the region to their security concerns in the South China Sea and ASEAN region, and speculatively to intra party conflicts. While these may be relevant and perhaps are interrelated, one factor that comes out with a degree of certainty is that the Chinese decisions and actions are deliberate and the present incident cannot be termed as inadvertent trespassing into India due to un-demarcated boundary. Since decades, the troops on both sides had their unwritten understanding of the LAC and had generally respected the same. Perhaps, the reasons may be attributed to Chinese sensitivity to any build up of border infrastructure by India, particularly in areas adjacent to Aksai Chin through which the Western Highway in Tibet passes. The DBO incident perhaps is an expression of Chinese displeasure and flexing of muscle in the wake of recent Indian efforts at building infrastructure in Ladakh Sector which has long been delayed. For the present, both countries had shown maturity and restraint and resolved to localise and not to further escalate the conflict. Both believe that the issue will be settled peacefully using the existing border management mechanisms and CBMs which were put in place. 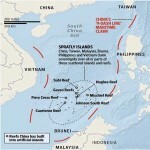 China’s selection of DBO for intrusion is deliberate and foresighted due to the area’s strategic importance. DBO is the Easternmost point of the Karakoram Range located about 8 KMs South of Chinese border and 9 KMs North West of Aksai Chin LAC. The Karakoram Pass lies to the North West of DBO at a distance of approximately 17 to 18 KMs. This area is contiguous to Pak Occupied Kashmir (POK) and adjacent to the portion of POK comprising Shaksgam Valley which was illegally ceded by Pakistan to China in 1963 through a border agreement between the two. The Highway linking Gilgit (later extended up to Skardu) in POK with Sinkiang Province in China passes through this area. Though this highway is generally called as Karakoram Highway, it does not pass through Karakoram Pass but through Khunjerab Pass lying further North of Karakoram Pass. 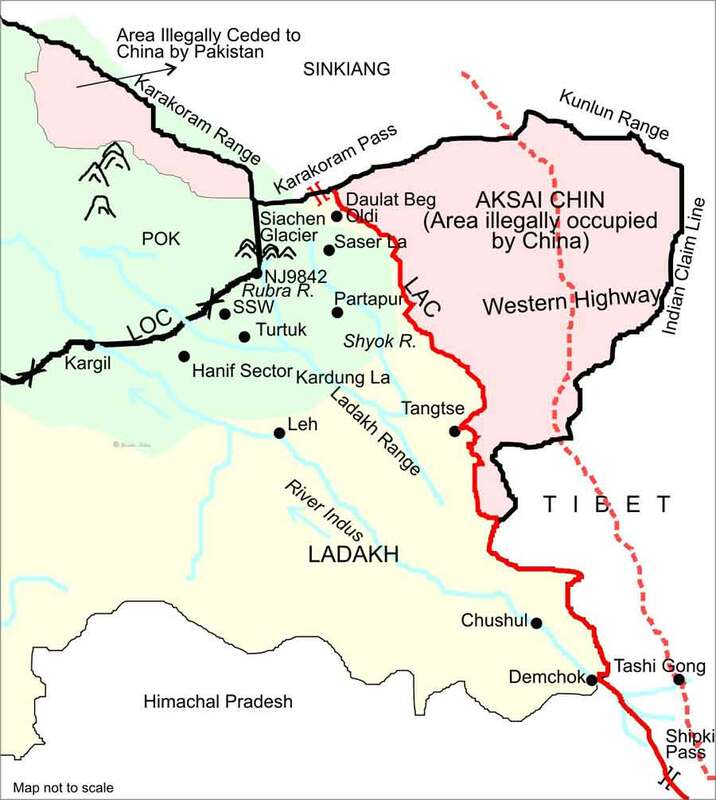 In Chinese centric view, with respect to their overall strategy relating to Sino-Indian border, the Western Sector comprising Aksai Chin perhaps assumes greater strategic importance vis-a-vis the Eastern Sector opposite Arunachal Pradesh. Mr T.S.Murty in his book on “India China Boundary” had down played the importance of Aksai Chin to China stating that many possible parallel road alignments linking Tibet with Sinkiang are available and need not necessarily pass through Aksai Chin, the importance of Aksai Chin to China in the present geostrategic context cannot be diluted. This aspect was aptly summed up by John W. Graver when he stated that “it ( Aksai Chin ) is essential to Chinese control of Western Tibet and very important to its control of all Tibet”. In Chinese centric view, with respect to their overall strategy relating to Sino-Indian border, the Western Sector comprising Aksai Chin perhaps assumes greater strategic importance vis-a-vis the Eastern Sector opposite Arunachal Pradesh. Since 1960, first Chou en – lai and subsequently many Chinese voices have been making swap offers that they will give up their claim to Arunachal in return for Indian recognition of Chinese occupation of Aksai Chin. This may be the result of inter-se priorities they assign to these two sectors or may be due to their realistic realisation that considering the geographical, physical and emotional integration of Arunachal with India, it may not be possible to annex it. This offer in effect would mean that India would give up what she lost to retain what she still has in possession. This swap arrangement was never considered seriously by either side. The above stated inter-se priorities of sectors though relevant to China, from the Indian perspective, the defence of Eastern Sector comprising Chumbi Valley and Arunachal is vital. Any loss or even a serious threat to these may seriously endanger the security of Siliguri Corridor and complete Brahmaputra Valley surrounded by Nagaland, Manipur, Mizoram, Tripura, Meghalaya and Assam. 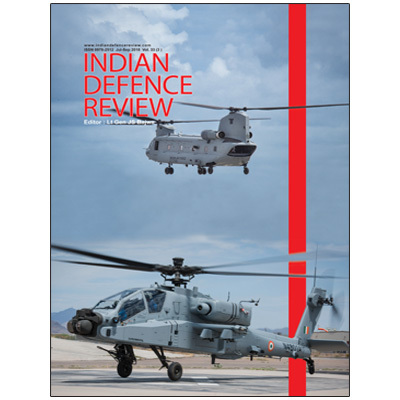 In macro terms, a plausible deduction that emerges is the Indian priorities in terms of a strong defensive posture in the East and use of Ladakh Sector as potential launching pad for counter offensive when required. The Chinese sensitivity and vulnerability in the Western Sector is obvious considering the proximity of Tibetan Western Highway to Indian line and the terrain configuration of areas adjoining Loma, Nyoma and Demchock which lend themselves to offensive operations including limited mechanised operations. As stated earlier, the area of DBO and Depsang is strategically important to both China and India from the perspective of both defensive and offensive operations. The greatest military threat to Ladakh, particularly to areas North and East of Ladakh Range including Siachen Glacier emanates from Northern Aksai Chin, DBO and Depsang plains as the area offers options for a credible collusive Sino-Pak military effort against India. An offensive by China through Depsang plains into Shyok and Nubra valleys across Saser La (Saser Pass) and a determined effort by Pak from West towards Thoise and Pratapur will envelop all areas North and East of Kardungla including Siachen. Such a course can certainly not be ruled out either for the present or in future. India should be extremely cautious about such a course and put in place a strong defence network in the area towards thwarting such an eventuality. Apart from a strong defensive perspective, the Dapsang valley should also be viewed by India as a launching pad for ingress into China. The Chinese are equally sensitive to any Indian thrust through Depsang area towards Karakoram Pass, Northern Aksai Chin and Sinkiang; the only opening available to India to Central Asia and Pamirs. Apart from a strong defensive perspective, the Dapsang valley should also be viewed by India as a launching pad for ingress into China. It is in this context, that India must work her strategy and responses both for the present to resolve the stand-off in DBO and as well for the future in long term perspective. Chinese continued presence in Depsang is not in India’s interests and sovereignty, and cannot be put in limbo. This is the first incident of this type after Somdurong Chu (Wangdung) intrusion of 1986-87 in Arunachal Pradesh, and seems to bear similar pattern as experienced in Wangdung. In formulating her response to DBO stand-off, India needs to take a closer look at the sequence of events and lessons learnt from the Wangdung incident. Initial Indian response to Wangdung intrusion which was detected in June 1986 was to localise the situation and defuse it through diplomacy. When diplomacy did not succeed and China resorted to escalation of conflict with troop accretions from 40 to more than 200 in the area of intrusion, movement of 20,000 troops with guns and helicopters into the sector and mobilisation of additional 8 divisions into Eastern Tibet by April 1987, India adopted a graded response in terms of troops build up and deployment. Between the period from Sept-Oct 1986 to April 1987, India initially airlifted and deployed a brigade from 5 Mountain Division in Zimithang on the ridges overlooking Wangdung area and followed it up with movement of 3 additional divisions into positions around Wangdung by early April 1987. India also carried out a massive air-land exercise titled “Chequerboard” which involved 10 divisions of the Indian Army and several squadrons of IAF, and redeployment of troops in several areas of the North East. Following troops build up, there were hectic diplomatic parlays between the two countries to defuse the situation. Indian External Affairs Minister made a visit to China in May 1987 and reaffirmed India’s desire to continue with border talks and reduce tension. In Aug, the local commanders of both sides met and decided to pull the troops apart. Eighth round of border talks were held in Nov 87 during which it was decided to end the military confrontation and laid down the groundwork for disengagement and pulling back of militaries of both. China extended an invitation to Prime Minister Rajiv Gandhi to visit China. Throughout the incident, India displayed a great sense of maturity, firmness and resolve. China might have realised the futility of an armed conflict with a well determined and well prepared India. According to Keshav Misra, “Overt display of military power had effectively neutralised any adventurist step” by China. Brig Pillalmarri Subramanyam, former Army Officer and served in DBO, Ladakh Area. Barahoti and Finger area in Sikkim. For Arunachal Pradesh, India must hold a referendum and as 90% people of Arunachal Pradesh supports India sovereignty, it will be in India. Arunachal Pradesh’s future must be decided by the people of Arunachal and not China. Therefore, this way Arunachal Pradesh will not be in status Quo and nor will it be under Give and take. When India took Sikkim in 1975, then also people of Sikkim voted for a union with India, same can be done for Arunachal as well. Deploy our best mountain divisions on the border with China. Indian Army must train the ladakhi locals as well with arms training in case of any conflict which may break out in future. China is a land thirsty country and its policy is to grab the land “”inch by inch””. Indian government’s reluctance to counter PLA incurions has resulted in India who have probably lost additional 1000 sq km territory since 1962 war. Indian Army must also mass hire soliders and officers as there is still a lot of vacant posts of the junior and senior officers in the Indian Army. Please be flexible enough to hire more officers in the Army as we need strength to counter China having an army of 22-25 Lac active troops. Our DRDO is also very backward and slow in developing arms and ammunitions and technology wise we are far behind China. If India wants to be a super power which India claims to be then India needs to develop its own technology to develop arms. No country can be a super power just by becoming the largest buyer of arms. India must adopt a very stringent policy on the border issue and must only show flexibility in case China is ready for a “”GIVE AND TAKE””. Staus Quo is not the solution. Aksai Chin can be ceded away with few specifications and changes.The boundry must be discussed as per McCartney-MacDonald Line of 1899 in Aksai Chin sector which will give India an advantage of retaking some of the lost land. India will have a control over Chip Chap valley, Galvan Valley, Dehra Compass , however Lingzi Tang Plains can be given to China as a goodwill gesture from India as it will give depth to China’s stretegic G219 highway. I have been reading strategy of China from 1950 to till now .The main thing about chinese is that they don’t want india to develop that infrastructure that they have built in pok and aksai chin .even they connected tibet from lhasa to sinkiang in 1950.Shame to politicians who are involved in corruption.. The fact is, Dalai Lama, who WAS NOT an indian, was born in what is now the so-called Arunachal Pradesh, which was a part of Tibet very long ago. Another fact is, the so-called Arunachal Pradesh was now occupied by India, which has for the past decades tried to move its people there.As to the reason of Sino-indian war, do you think it plausible to ascribe it to a feeling of being sidelined on the Chinese part? How ridiculous! A war caused by a feeling of not being taken seriously! Is that the history they taught you?Ok, now answer me: why Dalai Lama fled to India and why India was willing to accept him? Was it because China was sidelined? If you don’t believe my story of the war, you at least could see, by logical thinking, that India and China was not on good terms not because the latter was sidelined. It was because of territory disputes in the first place. Nehru had tried to take what is now called by India Arunachal Pradesh from China. And his reason is the McMahon Line, which was casually drawn by McMahon, regardless of the fact that Tibetans had lived areas south of that line for centuries. It was act of encroachment by the British. It as stealing! The Indians refused British occupation and freed themselves at last, but Nehru took a different stand when it comes to territoris taken by the aggressors from China, and wanted to Chinese to accept the encroachment and stealing. He even wanted to include Tibet in the “Big Inida” he dreamed of. By the way, the Indian opened fire first and killed first. Thanx sir, a very informative and well researched article. Thanks for sharing this use full information with us. Very incisive, well researched and erudite article. Completely in contrast with ‘cliched’ comments of our so-called foreign policy experts. This is the first article written in an easy to understand manner. It clearly describes the strategy required to handle this problem and also lay down the fundamentals of the actual ground problem. A very balanced &informative assessment of the problem. This article presents an in-depth analysis of the current incursion by China and the aggressive stand that the Chinese have adopted. It does not come as a surprise as they are in dispute on various other fronts in reference to land e.g. Japan, Taiwan and India. This aggressive stand that has been adopted was reported by a recent The Wall Street Journal Article .. China wants all it’s old territories back .. Taiwan, Japanese islands in dispute and parts of Indian territories. This article lays out the complete picture and the course of action. It can only be hoped that the indian politicians are listening. “Stregth respects strength” former president Abdul Kalam said. Strength is all round strength not military strength alone. India spends 40 b US$ on defence , 100 b US$ on debt servicing in a total outlay of 320 b US$ in 2013. Against that China spends 160 b US$ on defence, 200 b US$ in debt servicing in a total outlay of 1116 b US$. Author has explained the military situation and our reaction very well. I believe in short term besides what author has suggested we have to leverage common friends and countries facing strong arm tactics from China such as Japan and Vietnam to put pressure on China. On longer term we have to have national missions to improve productivity of defence expenditure and improve overall fiscal situation to make ourselves stronger. This can happen through strategic investments in energy (major import expenditure) alternatives, smart defence weapons and cyber warfare. Superb analysis and an excellent policy formulation by the Brigadier. Hope the Indian military will be able to get their message across to the political masters of the nation. Any false step in this matter by the political and civilian leadership would invite disaster for the nation. The jargon of “perception about the LOC” floated around in many circles to hush up debate and questioning is just a modern version of Hindi-Chini-Bhai-Bhai of the 1960s for which India paid heavily. It is amazing how some of the highly placed diplomats of India are naive in the area of international politics as can be seen from their writing such as MK Bhadrakumar’s rant in his punchline “Right-wing nationalism swarms India” – to quote: ” Why is the media or the political class shying away from even discussing the ground reality that history didn’t begin on April 15 in northern Ladakh and much water had flown under the bridge in the vicinity of the Chumar post in the Depsang Bulge area where Indian has been apparently acting belligerently when Gen (Retd) V K Singh was in command in South Block? 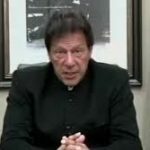 ” One can only hope that the military leadership would get their upper hand over such opposition to come to the rescue of the nation in the hour of need.